Merely having a credit card puts you at risk of credit card fraud, albeit a small risk. But, there certain things you do that make you even more at risk of becoming a victim of credit card fraud. Some of these you are unavoidable, but know that these actions mean you should monitor your credit card activity more closely to catch any unauthorized charges. After loaning your credit card to a friend or relative. Anytime someone else has your credit card, you’re at an increased risk of credit card fraud. Not that your loved one will abuse your credit card, but they may not be as careful with your card as you would be. After using your credit card at the gas pump. Credit card thieves are known to install credit card skimmers onto the credit card slot at the gas pump (and ATMs). These skimming devices are very hard to detect because they look like the real credit card reader. The skimmer captures and stores credit card information with each credit card swipe. The thief returns later to download all the card information. 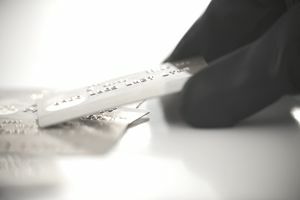 Some skimming devices are so sophisticated that the thief can use Bluetooth technology to download the credit card information from a distance, decreasing their chances of being caught. Gas stations may become even more of a target for fraud in the next several months. Most other retailers are upgrading to the more secure EMV credit card machines, but gas stations aren’t required to adopt the technology until 2017. After posting pictures of your credit card online. For some people, not posting your credit card information online is a no brainer. But there’s a twitter account filled with retweets from people who’ve done just that. While you may not intentionally upload pictures of your credit card, you could mistakenly tweet a restaurant selfie with your credit card lying on the table. After having your credit card lost or stolen. You’re probably at the most risk of credit card fraud if your credit card goes missing or your wallet is stolen. No doubt about it, if this happens call your credit card issuer immediately to report the missing credit card and have a new one sent to you. After downloading email attachments from an unknown source. Hackers can install spyware on your computer through email attachments and other downloads. Once the spyware has affected your computer, it can run undetected in the background of your computer, capturing and transmitting the data to the hackers. The hackers can use your credit card information to commit credit card fraud. Be very wary of the attachments you open and applications you download to your computer, even if they seem to come from someone you know. After a business you’ve shopped with has a data breach. More and more businesses are suffering data breaches, which puts millions of consumers’ credit card data in the hands of hackers. Businesses aren’t always required to notify consumers when there’s been a data breach and not every data breach is big enough to garner media attention. Always monitor your credit card account for fraudulent activity, especially if a business you’ve shopped has suffered a data breach. Credit card fraud can go undetected for weeks, months even, if you’re not monitoring your credit card closely. Review your credit card transactions often to catch fraud and deal with fraud as early as possible.